When I first began teaching mixology according to the old, American tradition back in 2008, it was perhaps a bit more surprising to bar-tenders that anyone would keep to the purist idea of what a cocktail is. It was not unusual for the objection of “Cocktails have changed” to be lodged. My response has not changed since those days. It’s not that true cocktails have changed. They really haven’t changed very much. 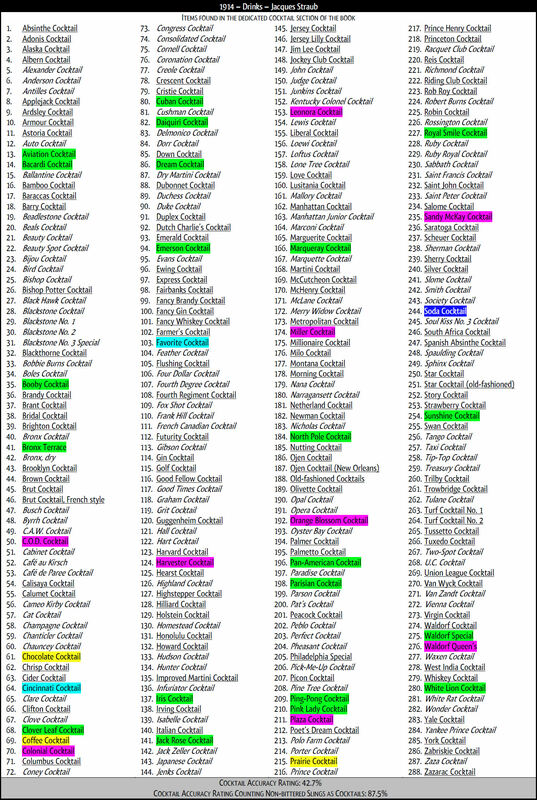 It’s more the case that the use of the word ‘cocktail’ has changed to include many types of drinks that were formerly known by different names. There was a time when I supposed that this change in the use of the word ‘cocktail’ was due to the Volstead Act and the period of ‘prohibition’ that it ushered in. But, that is not the case. Around 2009, I began to notice from pre-Volstead Act sources that the change in the use of the word cocktail had clearly begun before 1920 (when the Volstead Act went into effect). In this post, I will trace the rise of the spurious cocktails — those single-serving drinks of other genres that are often served in stemmed glassware and always falsely called cocktails. Their names are legion and well-known: Sidecar, Whiskey Sour, Cosmopolitan, Daiquiri, etc. Of course, for a sour (a punch, really) such as all those are — or even a flip or a blossom — to be called a cocktail required the breaking of the traditional drink-related understanding of the word. And so, this post will also trace the breaking of the American cocktail. I cannot strongly enough advise reading this post through. It will give you understanding of an important aspect of old drink books (and the historic loss of traditional mixology) that, so far, has escaped the notice of every last celebrated name hired to write the forwards for the contemporary reprint editions of these books. 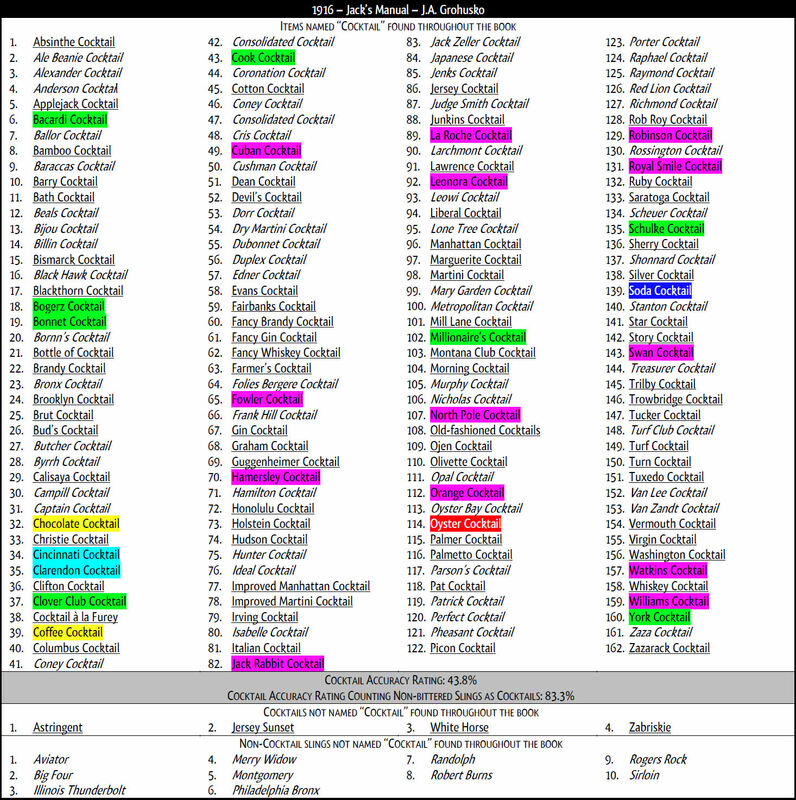 If the names of the above genres are unfamiliar to you, it will suffice to notice as you read this post that the more colored highlighting of drink names in any source below, the farther that author was from the traditional concept of what a cocktail is. It is also worth noting that the non-highlighted drink names that appear in italics are for non-bittered slings. If the cocktail is just another name for the bittered sling (which it is), then omitting the bitters from a drink that is otherwise like a cocktail means that the drink is just a sling of some sort, and not a true cocktail. True cocktails are just one sub-genre of the slings. They will be indicated here by being underlined. Spurious cocktails have been published in books going all the way back to Jerry Thomas. The so-called Soda Cocktail was nothing more than bitters added to cold soda water or lemon-flavored soda water. Below are the relevant items from O.H. Byron’s 1884 book, Modern Bar-Tenders’ Guide. It has a cocktail accuracy rating of 95.5% (the all time high, as far as I know). Next is the 1887 book, Jerry Thomas’ Bar-Tender’s Guide. It is doubtful that the book was actually written by the then-late Jerry Thomas. The authors removed the so-called Soda Cocktail from the cocktail section and put it in the “Temperance Drinks” section — where it belongs. They also indicated in a note under the so-called Coffee Cocktail (actually fitting the flip sub-genre of the possets) that they did not consider the drink to truly be a cocktail. With that in mind, one could argue that this book has a cocktail accuracy rating of 100%. However, since the drink (and its recipe) was left in the cocktail section, I find that the cocktail accuracy rating of this book is 94.7%. Below are the drinks in question. Below is the information we want from Harry Johnson’s 1888 book, Harry Johnson’s New and Improved Illustrated Bartender’s Manual. It has a cocktail accuracy rating of 92.3%. The rating is higher than Johnson’s earlier book since he added more true cocktails without adding any spurious ones. Next is William Schmidt’s 1892 book, Flowing Bowl. It seems to have been the first to list any non-bittered slings and even punches in the cocktail section. Schmidt was very much ahead of his time in so blurring the concept of the cocktail. The non-bittered slings are closely related to cocktails, but no one before him had called such drinks cocktails. Neither does any source after Schmidt call such drink cocktails for another decade. Schmidt’s book has a cocktail accuracy rating of 80%. If we feel like being generous and count the non-bittered slings together with the bittered slings as ‘cocktails’ (which I do not favor), the book would have a cocktail accuracy rating of 92%. Below are the relevant items. Next, below, we have one of my all-time favorite books on tipples, George Kappeler’s 1895, Modern American Drinks. 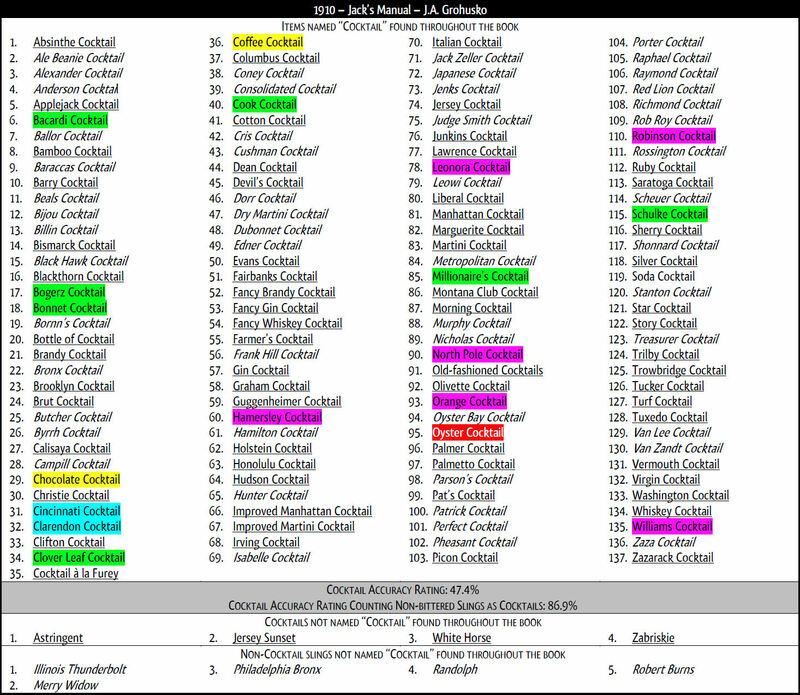 Its cocktail accuracy rating is back into the ‘A’ grade territory. Kappeler was the first drink-writing American bar-tender to include food items as cocktails, the so-called Clam Cocktail and the so-called Oyster Cocktail. But, his book also represents a sort of zenith in the history of the true cocktail. He remains mostly as faithful to the traditional cocktail as the books that came before him, and gives us a massively increased repertoire of them. Next, below, is the great little Gorham Cocktail Book of 1905. As far as I know, it is the only true cocktail book that has ever been published. It was a book that only gave recipes for cocktails — not sours, coolers, blossoms, punches, highballs, fizzes, daisies, etc. Therefore, it isn’t surprising that its cocktail accuracy rating is also in the ‘A’ grade range with an even 90%. Below are all of the recipe items from the entire book. Below is the information from Charles Mahoney’s 1905 book, Hoffman House Bartender’s Guide. Mahoney lists a punch and a non-bittered sling as cocktails. It seems no one else had done that since William Schmidt thirteen years earlier. Mahoney’s book has a cocktail accuracy rating of 83.7%. 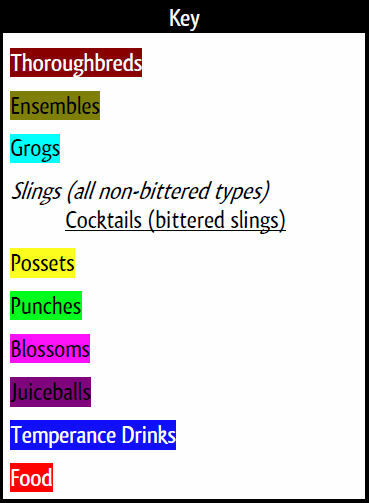 If we count the non-bittered slings as cocktails, the rating becomes 86%. Next, below, is the data from William Boothby’s 1908 book, World’s Drinks and How to Mix Them. In this book, Boothby explicitly wrote, “The idea of making any liquor into a cocktail was conceived only for the purpose of removing the sharp, raw taste peculiar to all plain liquors.Therefore it is not necessary to use a combination of cordials, essences or lemon juices as some ‘bar creatures’ do…” Of all drink writers of yore, only Boothby bothered to write out what was widely understood about the cocktail, it should strike the palate as little more than the liquor(s) it is made of, only slightly sweetened and diluted and with bitters added to remove the fumatic harshness of the ethanol. Thank you, William Boothby, for preserving that common bit of knowledge so that contemporary ‘bar creatures’ today might yet learn and repent! Boothby’s 1908 book is massively important for anyone studying American tipple tradition. It includes the oldest-known recipes for the Bronx Cocktail, the Sazerac Cocktail, and the Gibson [sling]. That said, Boothby’s 1908 book included as cocktails two non-bittered slings — the Gibson and the Zaza. Previous bar-tenders would have added bitters to Boothby’s two non-bittered slings and made them cocktails, since that’s what they were called. For the Gibson, Boothby even felt the need to explicitly write, “No bitters should ever be used in making this drink, but an olive is sometimes added.” He knew many bar-tenders would otherwise want to add bitters. And, yes, that’s an olive, not an onion. The Gibson is the original name for what people today call the ‘classic’ Martini. We can see that the cocktail is broken in Grohusko’s 1910 book in about the same way as it is now — just not quite as extremely so. But, was that the turning point? Below is the information from Thomas Bullock’s 1917 book, Ideal Bartender. It has a cocktail accuracy rating of 32.4% — a failing ‘F’ grade. If we count non-bittered slings as cocktails, the rating rises to 64.9%. Finally, below, we have the evaluation of Hugo Ensslin’s 1917 book, How to Mix Drinks. Instead of Grohusko’s practice of running all drinks together in roughly alphabetic fashion, regardless of genre, Ensslin returns to having a dedicated cocktail section. But, that seems to amount to very little. 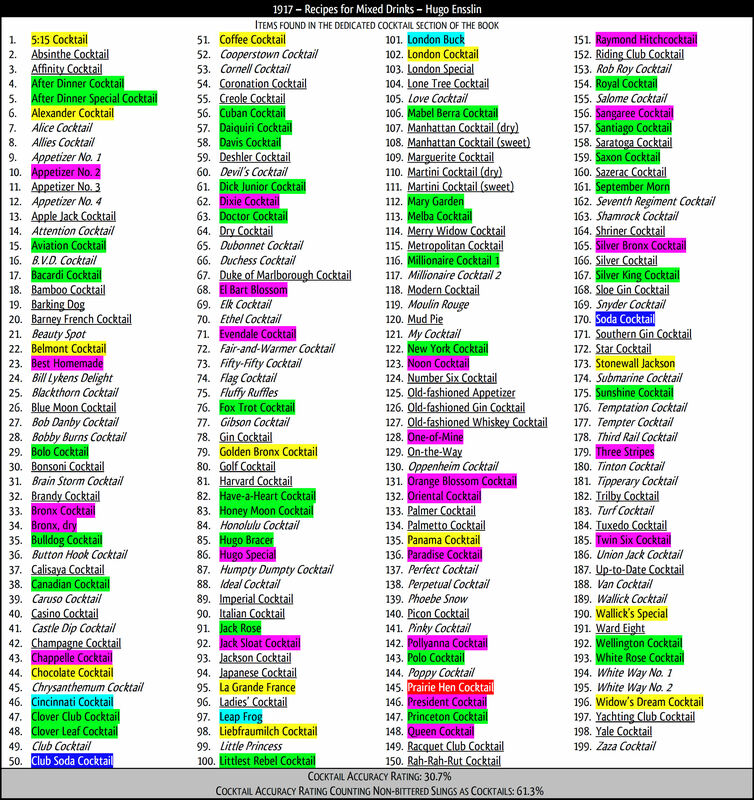 Look at the colored highlighting of so many drinks from his cocktail section. Each one of those is something not only other than a cocktail — they aren’t even slings. Sadly, Ensslin’s concept of what a cocktail is seems just as befuddled and empty as that of post-1920 books such as Harry Craddock’s Savoy Cocktail Book (sic). Ensslin’s book has a cocktail accuracy rating of just 30.7 percent — a miserably failing ‘F’ grade worthy of books from the 1930’s! Even if we are generous and allow the counting of non-bittered slings as bittered slings (cocktails), the book only reaches a rating of 61.3%. In summation, I think that it is clear that whether we say that the (concept of the) American cocktail was broken in 1910 or not, by 1917 it surely was. That means that it really is not accurate to carry on accusing the Volstead Act of being the culprit. The American cocktail was broken before ‘prohibition’ ever got its hands on it. The question is: why? I have thought very much about what broke the cocktail around 1910. It is possible that the growing fame of the cocktail had already driven enough people to seek them out that there were more people with interest in cocktails than those with awareness of what they were. It’s also possible that the preference among some (undoubtedly alcoholic) men for the un-bittered, stiffer, alcoholic sensation of the Gibson and other non-bittered slings was the first crack in the cocktail. Perhaps the growing stigmatization of drinking alcohol had some negative affect on the profession and training standards of tending bar. Perhaps all of these were factors. I have no really substantial hypothesis. Let’s not wait for some celebrated drinks historian to realize that they haven’t even begun to understand this historic phenomenon. They still seem too busy wrapping themselves up in the glamorous veneer and positive social bias associated by many with the word cocktail to have anything worthwhile to say about this. But, perhaps one of you, my readers, will have some insight on this history and share it. Now, go stir up a good Whiskey Cocktail, strain it and drink it — but, for Bacchus’ sake, not from a coupe! It’s years over-due, but Elemental Mixology’s finally is getting a new web look! Anyone considering taking the Elemental Mixology Advanced Craftmasters’ Course during Portland ‘Cocktail’ Week who wonders if the course is really right for them should take the placement test. There are only ten questions.